Copyright © David Richerson - This image is copyrighted. Unauthorized reproduction prohibited. 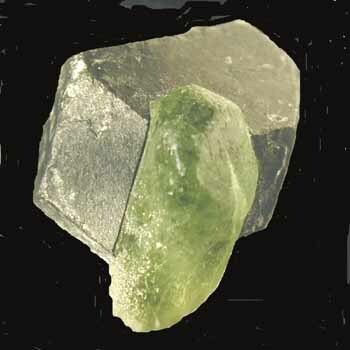 Very interesting combination of a forsterite variety peridot crystal perched on a magnetite crystal. Overall specimen size is 3.2cm x 2cm x 2cm. Dave Richerson specimen and photograph.